Thank you for choosing to pay your invoice online. Note, under no circumstances will Poets & Writers charge your credit/debit card without your direct consent. For your security, we do not charge credit/debit cards automatically, nor do we charge credit/debit cards on a schedule. Below are instructions to submit your online payment. If you have any questions, please call the advertising department at (212) 226-3586, extension 211. If you prefer to pay by check, you can mail a check to: Poets & Writers, Inc., 90 Broad Street, Suite 2100, New York, NY 10004. Your Customer ID and Invoice Number can be found on your invoice. 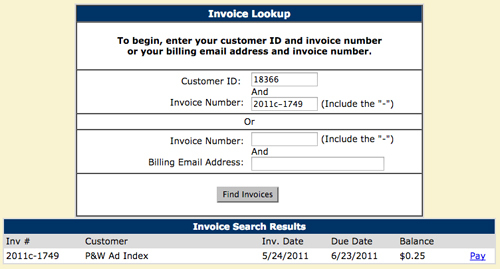 Fill in those fields and click "Find Invoices" to see the invoices on your account that are due for payment. You may also search by entering the Invoice Number and your Billing E-mail Address. Any invoices with balances due will appear. 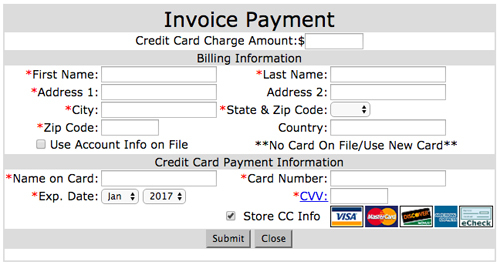 Click "Pay" next to the invoice for which you wish to submit a payment. When paying online, invoices must be paid individually. If you wish to make one payment for multiple invoices, please call (212) 226-3586, extension 211. The billing address should match the billing address for the credit/debit card you intend to use for payment. If the billing address fields are already populated, please make sure the address matches that of your card. If not, please clear the fields and enter the correct information. If you do not wish to keep your credit/debit card information on file, uncheck the box next to "Store CC Info". If your credit/debit card information is already saved and you need to enter new credit/debit card information, uncheck the box next to "Use Account Info on File". You will then be able to enter new credit/debit card information.